No!! No!! No!! I’m not going to renew my 3-year SAVEUR subscription! Why would I? At the rate they’re going, I feel sure that the magazine is going to fold well before a 3-year subscription is completely filled. But, whining is not really why I’m here today. I’m really here to rave about Iraqi pink rice rather than the pillowy soft Persian flatbread that we first tried it with. We’ve been making Iraqi Chicken with Pink Rice for at least two years and the other night, we decided to have it again. To remind ourselves what we did, we looked here on the blog. And it wasn’t there. How on earth have I neglected to say anything about this fabulous rice before now? One night, when we were going to have Djaj Bil-Bahar Il-Asfar (Iraqi chicken) yet again (because we just can’t stop making it – it’s our favourite), we thought it would be nice to serve it with rice. When T was travelling through Iran (long ago, before the recent wars in Iraq), he was met with the most amazing hospitality. Any time he talks about going into a cafe, his face softens and his eyes mist over as he reminisces about the people serving the wonderful simple fare: grilled meat and rice. Now, granted, Iran and Iraq are different. But I suspect that both have very similar cuisine. Initially, when we opted for rice rather than bread, we were going to serve the Iraqi chicken with plain rice. But we were pretty sure that we had seen something about a coloured rice in SAVEUR. At first we thought it was in the article about food trucks in Portland, where we were reminded that one of the trucks featured is run by people from Iraq, where they serve “home cooking”. [A]t Aladdin’s Castle Cafe, where Ghaith Sahib and his mother, Nawal Jasim, prepare Iraqi home cooking in a cozy camper painted mustard yellow. “In his country, it’s a point of shame for men to cook at home,” Ghaith’s wife and cart co-owner, Tiffany, told me, “But he’s a great cook.” The couple met in Amsterdam after Ghaith was injured by a car bomb during the war in Iraq. He was able to come to the States and, ultimately, to bring his mother over. Opening a food cart serving Iraqi and other Middle Eastern dishes was a way for them to create a business around something they enjoyed and knew how to do well. It took off: They now have a small restaurant in addition to the cart. Alas, there were no recipes from Aladdin’s Castle Cafe!! Searching through our other back-issues of SAVEUR (because we were certain that we’d read about this rice there) produced the recipe, “Beet Stew with Lamb Meatballs” in SAVEUR “Why Lamb Rules” Issue No. 123 entitled. There is a beautiful full-page photograph of it, taken by Andrè Baranowski, in the “Understanding Lamb” article. SAVEUR test kitchen assistant Yael Coty learned to make this [traditional Iraqi-Jewish] dish from her grandparents, who left Iraq for Israel in 1950. […] Prepare the rice: Strain rice and transfer to a 2-qt. saucepan along with the salt, turmeric, and 2 cups water. Bring to a boil, reduce heat to low, cover, and cook for 10 minutes. Remove pot from heat and keep covered in a warm place. That sounds okay. Still, once we’d started, we couldn’t stop ourselves from consulting other people’s versions of Iraqi rice…. Nope, nothing to speak of on our coobook shelves either. But that’s what the internet is for, isn’t it? Iraqi pink rice is very much a staple food at the Jewish Iraqi table. It is served with almost every main course, and makes a tasty addition to your meal. T’beet, a chicken stuffed with rice and spices and cooked buried in more rice and spices, was the traditional Sabbath lunch of the Babylonian Jews of Iraq for generations. I say “was” because apart from the older generation of exiled Iraqi Jews, like my mother and a few relatives, very few people make this dish today. Put the rice into a pot and cover with cold water. Use your fingers to gently mix it. Pour the water out and repeat two more times until the water is relatively uncloudy. In a largish heavy bottomed pot over medium heat, sauté the onions in oil until they become translucent. Add the garlic and cook for about another minute until beginning to colour. Add tomato sauce and cook until sauce becomes quite thick. Then, add the uncooked rice, stirring quickly for 30 seconds to coat it completely. Immediately add the stock, tomato sauce, salt, and pepper; turn the heat up to high. As soon as it comes to a boil, cover the pot with a tight-fitting lid; place it on a footed rack over the hot burner and immediately turn the heat off. Allow the rice to sit, always covered, for 40 minutes. Just before serving, fluff the rice with a fork. 1.) Chicken Stock The amount of liquid will vary, depending on the rice used. We’ve found that with the Basmati rice we buy, 1+5/8 cups of liquid for 1 cup of uncooked rice is the correct amount. The finished rice should be quite separate and dry, ie: NOT sticky. 2.) Tomato Sauce T makes the tomato sauce we use by cooking chopped onions in olive oil until they’re limp, then adding chopped fresh tomatoes (with the seeds and skin intact) and a bay leaf, and sometimes a little oregano. He then simmers the sauce until it is very thick – it’s almost the consistency of tomato paste. The tomatoes can be any kind – plum, beefsteak, vine, cherry – they just have to be ripe. And now, we can’t stop serving Djaj Bil-Bahar Il-Asfar with pink rice. Sure, it’s great with pillowy naan. But, but, but we love it so with pink rice! We served the rice and chicken with beet greens & yellow pepper (in this case: grilled chicken wings that had been dusted with Iraqi yellow spice powder). The garnishes are summer savory and Thai basil from the garden. Thai basil?! Well, why not? That’s the beauty of living in Canada. We can mix and match cuisines without fear of apprisal. About a week ago, the final issue of my SAVEUR subscription arrived and, under separate cover, a letter from SAVEUR reminding me that I hadn’t yet renewed my subscription. I quickly leafed through the magazine. Meh (heh, see what happens to my language when we eat Iraqi-Jewish Pink Rice?) The magazine looks like a clone of Lady’s Home Journal. But the photos might not be quite as good. A coupon dropped out of the magazine. Big red letters shouted at me to “Save up to 63%”. Further reading of the smaller print informed me that I could get 3 years (27 issues) for $49.95. They neglect to say anything about shipping charges or the fact that the price is in US dollars…. 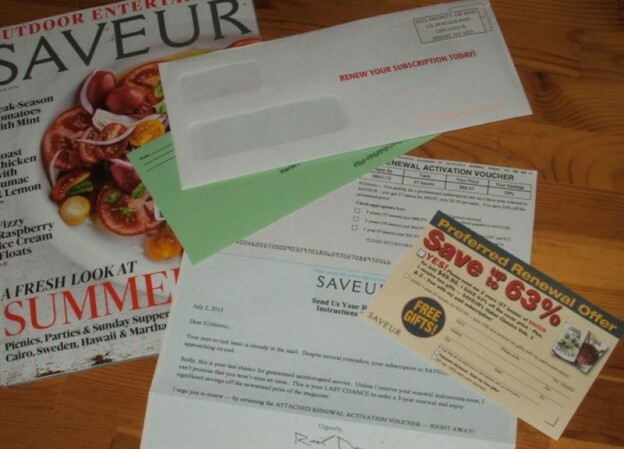 The reminder letter, dated July 2, 2015, says, “You qualify for a professional rate [$88.97 for 3 years] […] Despite several reminders, your subscription to SAVEUR is approaching its end. […] This is your LAST CHANCE to order a 3-year renewal and enjoy significant savings”. The letter is signed “urgently”. Hmmm. Am I supposed to be flattered that SAVEUR is mistaking me for a professional? And… does SAVEUR Magazine really think that professionals should pay more? Perhaps it’s a test by SAVEUR marketers to see if anyone is still reading anything in their magazine. This is partially mirrored on SAVEUR’S FB page. » Two kinds of Cherry Snowballs: which one is your favourite? » Stretch Chicken is Great! » Got Kecap Manis? Make Nasi Goreng! » It’s Pie Day – does you know wear you’re mittens are? » Got 7 days? Make bacon! This entry was posted in 'Saveur' Magazine review, food & drink, posts with recipes, side, whine on Sunday, 2 August 2015 by ejm. Are we really saying goodbye?